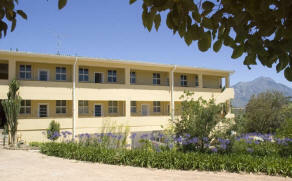 Accommodation in Tulbagh: Alfa Apartments. Clean, comfortable, spacious, owner managed apartments in Tulbagh. Well equipped kitchens for self catering including sufficient tea and coffee supplies. Breakfast options available if pre-booked. Choice of kingsize or twin beds. Secure undercover parking. Lovely views of the surrounding mountains. Within walking distance of restaurants, pubs, theatre, galleries, shops, historical Church Street and museums. Conveniently situated, the perfect base from which to explore all that our scenic area has to offer. Reduced rates for stays of two nights or longer.